As the weather turns cold again, I’ve got soup on the brain. It’s easy to make a big batch at the start of the week, and I love coming home to a warm, satisfying bowl at the end of a long work day. But sometimes, I get bored making the same traditional recipes throughout the winter. 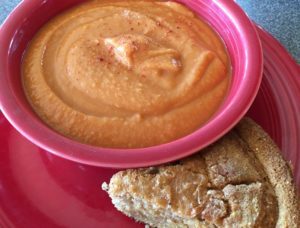 To break out of a rut, try this hearty sweet potato soup. The ingredients may seem odd if you’ve never experienced this regional cuisine, but the flavor combination is truly delicious. And when you’re making up your list for the market, be sure to pick up the ingredients for Vermont maple cornbread to go with it. I adapted this recipe from Africa South of the Sahara by Robert Stock. Gluten-free and Vegan. Serves 8-10. Thickly slice the onions and carrots, and sauté them in oil in a large soup pot for 5 minutes over medium heat. Meanwhile, peel the sweet potatoes and cut them into pieces that are 1/2 inch thick on the smallest dimension. Add the sweet potatoes to the pot along with the tomato juice, broth, and grated ginger, and cover. Reduce the temperature to a slow simmer. Cook for 30 minutes, then check the carrots and potatoes to be sure they’re thoroughly cooked and soft. If not, cook for another 10 minutes and check again. When the starchy vegetables are soft, add a pinch of cayenne pepper to the pot, then use an immersion blender to puree the soup to a smooth consistency. Add the peanut butter and stir it in to melt, then puree once more. If the soup is too thick you can thin it with more water or vegetable broth. Taste the soup and adjust the salt and spice level as desired. Serve with Vermont Maple Cornbread. Hi Sarah – this sounds delicious and I’m eager to try it. 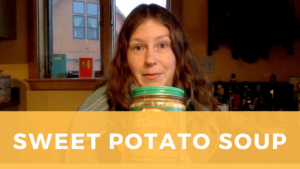 Could you give an appropriate total weight for the sweet potatoes in the recipe? Sweet potatoes are so variable in size that I’m never sure what a recipe writer might have in mind. Thank you! Hi Cathy! Thanks for your comment. Yes, I struggled with how specific to be with the amounts. One of the original sources suggested “cups” which is specific, but hard to determine when buying produce. I’ll update the recipe with weights – that’s a good suggestion.